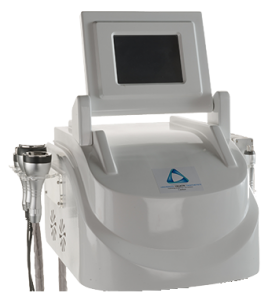 Cavitation it is an advanced aesthetic equipment for breaking up adipose tissue. It represents an excellent add-on for the treatment of stubborn for deposits that never seems to disappear no matter of your abdomen, flanks (love handles), thighs (saddle bags), buttocks, inner knees, upper arm & male breasts. It is a natural phenomenon based on low frequency ultrasound. The ultrasound field creates bubbles in the liquid, which gradually grow, energy in the form of heat (minor effect) and pressure wave (major effect) is released. As the membranes of fat cells do not have the structural capacity to withstand the vibrations, the effect of cavitation easily breaks them, while sparing the vascular, nervous and muscular tissues. The result is instant inch loss. Low frequency ultrasonic waves are used to produce lipolysis (liquefaction) of fat cell breaking down fibrosis and finally some content of adipocytes is metabolized by the liver and eliminated in the urine, so it is always recommended drinking plenty of water both the day of treatment and subsequent days. We use Cavi-Lux from Universal Medical Aesthetics for the services. Uses leading edge ultrasonic liposuction techniques.